Henry Watson celebrates his first goal in a Hillians shirt. 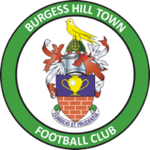 The Hillians produced a solid all-round performance to beat Tooting & Mitcham United 2-0 in the Velocity Trophy. 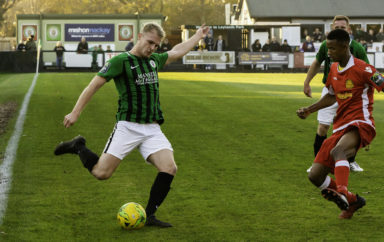 Simon Wormull & John Rattle, as expected, utilised their squad, making six changes to the side that gained a point at Bishop’s Stortford on Saturday – as well as including youngsters, Kieron Dimelow & Alfie Haggar, on the bench. The visitors started the game brightly, with the first chance of the game falling to Hady Ghandour, but his effort flew over Bromage’s crossbar. 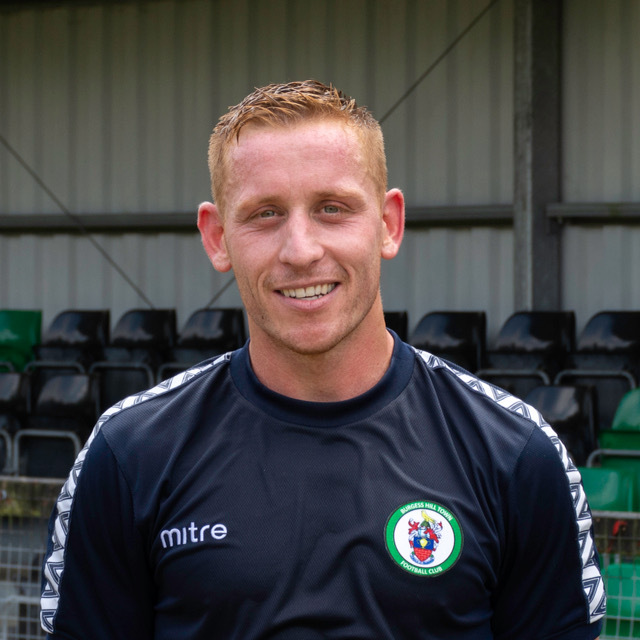 Sam Fisk then passed up a golden opportunity to open the scoring for the Hillians, as Kieron Pamment’s delightful cross found the defender’s head, but then found the arms Liam Sallis. In the 32nd minute, the Hillians broke the deadlock, as Henry Watson, being utilised slightly further forward than usual(! ), unleashed a stunning half volley passed the helpless Sallis – via the crossbar. The Hillians continued to dominate the half, with Smith-Joseph’s and Pamment’s pace causing the visitors plenty of problems. Tooting started the second half brightly, coming out of the dressing room with a renewed energy. 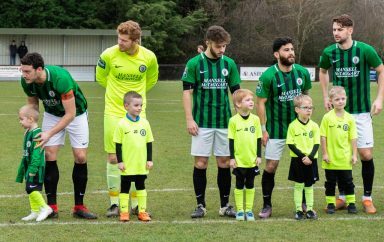 Wormull & Rattle introduced Dan Back and Tom Cadman in the 63rd minute, and it was that man, Beck, who had a big part in the Hillians’ second. The midfielder delightfully flicked the ball over his marker, before feeding Pat Harding who turned Fadahunsi inside-out and unleashing a curling effort past Sallis. 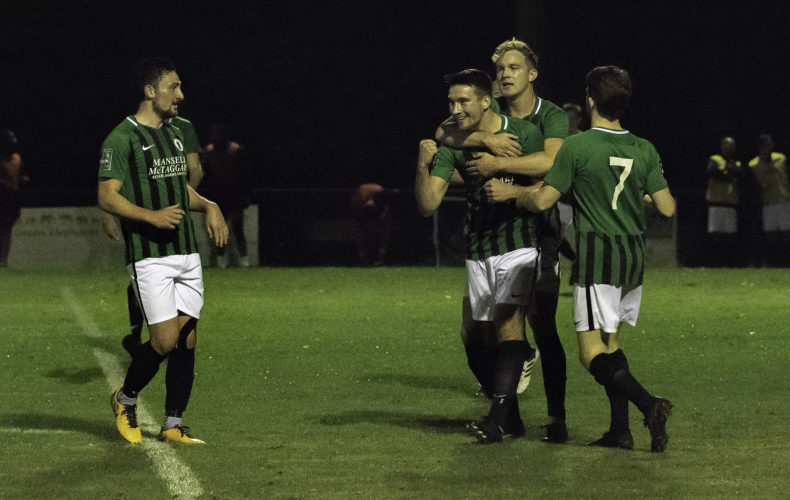 Under 18, Alfie Haggar, entered the field of play, in the 74th minute, for his First Team debut, as the Hillians comfortably held out for the victory. A professional display by the Hillians, which puts ourselves into the hat for the Third Round draw. The Hillians MOTM was awarded to Pat Harding, who worked tirelessly up-front all evening, topping his performance off with a peach of a goal. Thank you for your support this evening! Next up…it’s Non-League Day!